I originally published this article in response to a question on Quora.com, but since everyone who finds out that I share my life with a shiba inu asks me, “What are shiba inus like as pets?” I thought I would blog my response here, too. I should note that, despite the search-engine-friendly title, one does not own a shiba inu or any dog. We share our lives with them, care for them, and love them, and in return they give us their unwavering affection and loyalty. I’ve lived with dogs all my life, from lovable mutts (I still think of you all the time, Ladybug) to everyday Labs and golden retrievers, to more exotic breeds like Pulik. (Little Hungarian Rastafarians.) I’ve trained handled and raised dogs for the conformation show ring (primarily American cocker spaniels). I worked in administration and marketing for an all breed dog grooming school, and edited their grooming guidelines and textbook. I’ve known a lot of dogs. But nothing compares to my shiba inu. My family rescued Toshi five years ago, when he was 10 weeks old, and he has owned our hearts ever since. This is little Toshi at 10 weeks old when he first joined our family as a rescue. How can you resist that foxy face? I first met shibas when I was working at the dog grooming school. Occasionally, to give the students work on breeds that require heavy brushing, a local show breeder would bring in her pack of four or five shibas. When they arrived in the reception area, they would be happily wagging their plumed tails, but also tussling with each other and “talking” in their strange little voices. I knew immediately that one day, when the time was right, I’d share my home and heart with a shiba inu. Shiba Inu translates to “brushwood dog” (or perhaps “little brushwood dog”) in Japanese. They’re compact in size — about 13-17″, with males being bigger. They have a dense double coat with a coarse outer layer and a soft thick undercoat. That undercoat sheds twice annually in a crazy vacuum-clogging shedpocalypse. I call my area rugs “hair traffic controllers” because they’re the only thing stopping great balls of hair from rolling across my hardwood floors like tumbleweeds across a prairie. Almost insta-housebroken. With few exceptions, shibas are very clean. 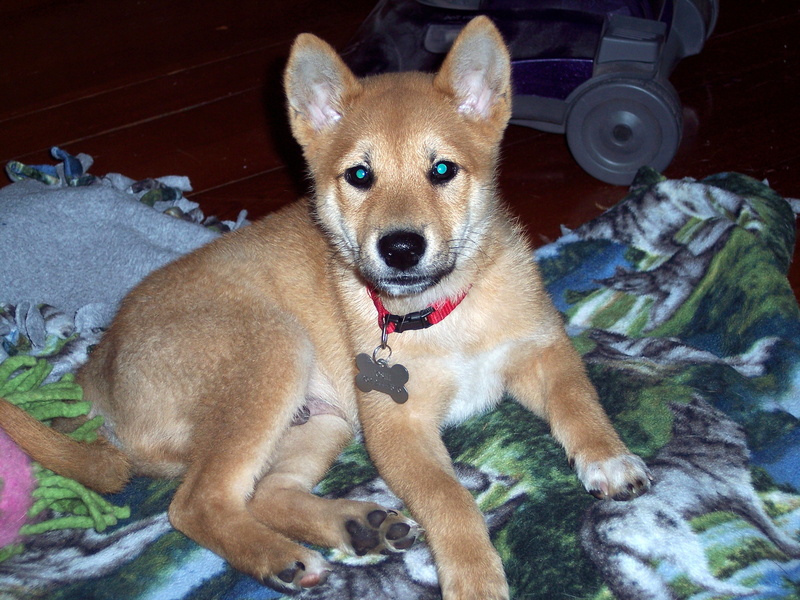 Toshi had but two accidents in the house as a 10-week-old puppy before he was completely housebroken. He even taught himself to scratch at the door to indicate that he wants to go out. In my family, we joke that he would sooner explode than make a mess in the house. Independent and often aloof. Although some shibas like to cuddle, most are content merely being within proximity of their people. Sensitive. Betray a shiba’s trust and he will remember. Frighten him, and he’ll stay cautious for a very long time, if not forever. I’ve never known a more sensitive breed. Shibas are far more closely related to their wild kin than most modern breeds, and because of that it’s important that you gain their trust. Gentle-but-firm, confident and consistent training is the key to a happy, well-adjusted shiba. Occasionally neurotic. Because they are so sensitive, shibas may develop fears that their owners will need to cope with and try to quell. My boy developed a pathological fear of the gunshot sounds in my son’s video games and will try to climb me and perch on my shoulder for comfort. At age five he suddenly developed a fear of fireworks and actually tore my bedroom closet door off its track to hide while the family was out watching the 4th of July fireworks show. Incredibly loyal and intuitive. Sure, all dogs are loyal friends, but the shiba inu goes the extra mile. If you’ve won his trust, then you are his person an he’ll be there for you no matter what. After my mom passed away suddenly, Toshi instinctively knew that I was distraught. Although he prefers to sleep on the couch, for weeks he followed me to bed and slept curled by my side. One night I awoke from a vivid dream about my mom, and Toshi leaped up, pressed his forehead to mine, and stood there letting me pet him until I was able to stop crying. Many shiba owners I know have similar stories. I’ve known shiba people to say, “If I’m stressed, my shiba knows almost before I do.” Shibas are natural empaths. The Shiba Scream. Their form of serious protest — quite alarming! Huffing and puffing. The shiba’s language is one of indignant sighs and snorts. The Shiba 500. Expect a shiba to get a case of the zoomies every now and then and run around like his tail is on fire. Hilarity ensues! The Shiba Stare. He will stand before you and calmly stare. For no reason whatsoever. He’s peering into your soul. Talking. Shibas are generally not very barky, but they do make all kinds of funny vocalizations when they want your attention. Here’s an epic Shiba 500! Shibas will do this solo, too, but it’s more fun with a friend. This video demonstrates some of the shiba’s vocalizations. (They do bark, by the way. But they’re far more likely to make funny sounds like Ozy here.) It also shows some indignant huffing and puffing! It’s difficult to compare shiba inus to other dog breeds because each breed has its own innate characteristics, and each dog is an individual. I will say that if you’re accustomed to the easy-to-train, eager-to-please types of dogs (like many of the sporting breeds, for instance), you’ll find that the shiba is a vastly different type of dog with quirks you won’t be expecting. They are an ancient Asiatic breed that is far more wolf-like than most domesticated bogs. Because they’re sensitive and headstrong, it’s often recommended that shiba owners have prior dog experience, particularly with other headstrong breeds like terriers or spitz-types (huskies, malamutes). I’ve encountered successful shiba owners who are first-time dog owners, but that’s rare. I believe you’ll be much happier with a shiba if you know dogs, and happier still if you’ve had experience training some of the more intelligent, stubborn breeds. Honestly, the doge meme didn’t do the shiba inu any favors. They were gaining in popularity before it hit, but once it was everywhere, people started clamoring for a doge of their very own. Unfortunately, any time a breed sees a spike in popularity, supply-and-demand kicks in and backyard breeders and puppy mills begin cranking out dogs en masse. Aside from often keeping hordes of dogs in deplorable conditions, these breeders pay little to no attention to things like temperament and health issues. If you’ve decided that the shiba inu is for you, do your homework. Many rescue groups have dogs and puppies available (some perfectly healthy, others with special needs) who would love to share your home. 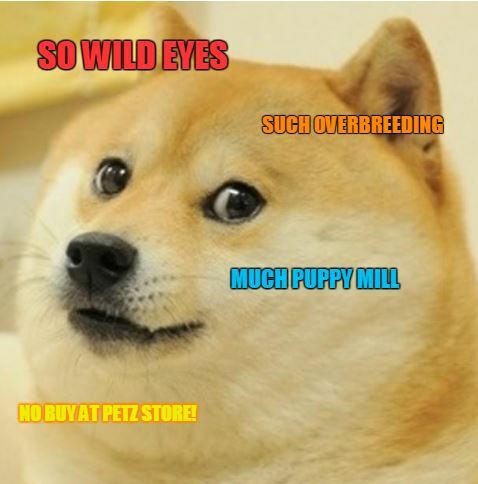 If you prefer to buy directly from a breeder rather than rescue, get recommendations from other shiba owners (there are several shiba owner groups on Facebook, which would be a good place to start). Make sure the breeder offers a health guarantee. Please don’t buy from pet shops — that only perpetuates the puppy mill problem by increasing the demand, thus giving mill owners reason to amp up the supply. Not everyone can handle a shiba, but if you happen to be the right match for the breed, then there’s no more loyal, intelligent, trustworthy friend. First time Shiba Owner and my Loki fits in perfectly well with my Family. Nothing “normal” about a shiba! I happen to think it’s worth the effort. though.